Looking to do Bible memory work with young children? Tony Kummer offers the following 10 Easy Bible Memory Verses For Kids. Here are the kids bible memory verses that I recommend as a good starting point. They will help children think about the character of God. By starting with easy Bible verses, the children will have confidence to learn more. These are also great to use as preschool Bible verses. 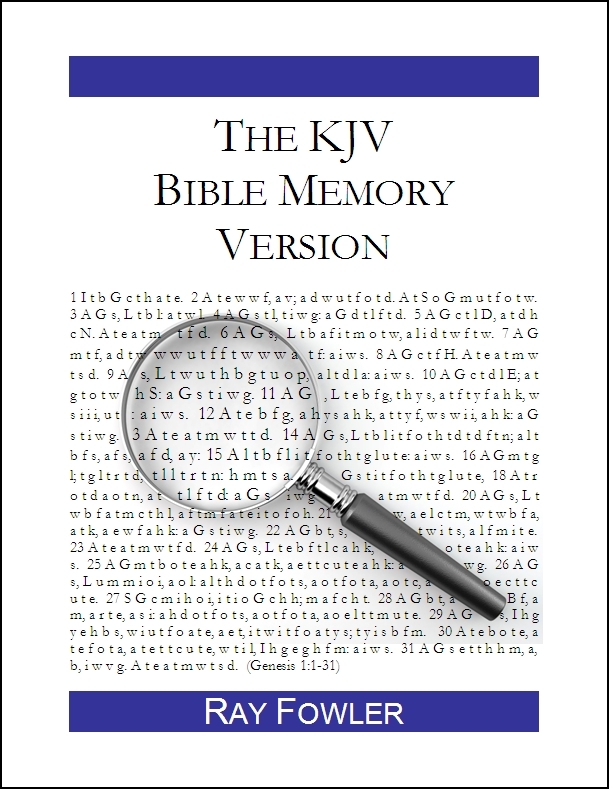 My book, The KJV Bible Memory Version, is now available at both Amazon and Barnes & Noble for just $4.99. Of course you can also buy it for the same price right here at the website (DRM-free in either mobipocket or ePub format). And remember, if you don’t have an e-reader like a Kindle, Nook or iPad, you can always download a free e-reader here. This summer I released the first book in The Bible Memory Version series, using the King James Version of the Bible. I hope to release The Bible Memory Version in all the major translations so that anyone can use this tool to memorize Scripture in their preferred translation. I have started contacting publishers to obtain permissions for other translations, so I thought it would be helpful to run a poll and find out which translation(s) people would most like next. Which translation of The Bible Memory Version would you like to see released next? Note: If you are reading this by email or RSS, click here to participate in the poll. The Bible Memory Version is available for purchase here at my website (in ePub or Kindle format) and also through Amazon or Barnes & Noble. If you don’t have an e-reader, you can download a free e-reader here. I am excited to announce the release of what I hope is the first book in a series: The Bible Memory Version: A Tool for Treasuring God’s Word in Your Heart. Bible memory has long been a passion in my life, and I hope The Bible Memory Version will help others catch a vision for Bible memory in their lives too. The Bible Memory Version is an interactive book that helps you memorize and review whole sections of the Bible. Click on any verse or passage of Scripture, and it instantly switches to first-letter view. (Click here for an example of how this works.) The first-letter method is based on memory research which shows that recalling information is a far more effective way to memorize than merely repeating information. I am excited about this project and hope to work with publishers to produce Bible Memory Versions in various translations. If you would like The Bible Memory Version released in a specific translation, please email me at digital-books@rayfowler.org. If you don’t have an e-reader, you can download a free e-reader here for your computer or portable device. So what do you think of this project? Let me know in the comments section below! Click here to purchase The Bible Memory Version now. Click here to see all the titles available at Fowler Digital Books. Dietrich Bonhoeffer required his seminarians to give half an hour each morning to scripture meditation. Many of the students struggled with this task, so he wrote these instructions to help them understand the importance of meditation and to help them learn how to meditate on God’s Word. Because I am a Christian. Therefore, every day in which I do not penetrate more deeply into the knowledge of God’s Word in Holy Scripture is a lost day for me. I can only move forward with certainty upon the firm ground of the Word of God. And, as a Christian, I learn to know the Holy Scripture in no other way than by hearing the Word preached and by prayerful meditation. Because I am a preacher of the Word. I cannot expound the Scripture for others if I do not let it speak daily to me. I will misuse the Word in my office as preacher if I do not continue to meditate upon it in prayer. If the Word has become empty for me in my daily administrations, if I no longer experience it, that proves I have not let the Word speak personally to me for a long time. I will offend against my calling if I do not seek each day in prayer the word that my Lord wants to say to me for that day. Ministers of the Word are especially called upon to perform the office of prayer: “But we will devote oursleves to prayer and the ministry of the word” (Acts 6:4). The pastor must pray than others, and has more to pray about. Because I need a firm discipline of prayer. We like to pray according to our moods — briefly, at length, or not at all. But that is to be arbitrary. Prayer is not a free-will offering to God; it is obligatory service, something that he requires. We are not free to engage in it according to our own wishes. Prayer is the first divine service in the day. God requires that we take time for this service. “Early in the morning I cry out to you, for in your word is my trust. My eyes are open in the night watches, that I may meditate upon your promise” (Psalm 119:147-148). “Seven times a day do I praise you, because of your righteous judgments” (Psalm 119:164). Because I need help against the ungodly haste and unrest which threaten my work as a pastor. Only from the peace of God’s Word can there flow the proper, devoted service of each day. (From Dietrich Bonhoeffer, Meditating on the Word, pp. 22-23). For more on Bible meditation, click here for The Bible Memory Version. The Bigsby Show has a great video and song to help children (and adults) learn the books of the Bible. Music is a great way to memorize. I still use the song that I learned as a child for the New Testament books to get the order right (and that’s after going to seminary!). You can download the video for $1.99 here. Guitar chords are available for free here. The performance track mp3 is available for free here. GPS Bible Study. Tim Challies tries out his new GPS and offers some related thoughts on Bible study. On Hyphenated Names. Frederica Mathewes-Green shares the amusing misadventures of taking on a hyphenated married name. Bible Memory. Demian Farnworth offers 18 practical tips to help you memorize more Scripture. Longevity. Did you know that two of President John Tyler’s grandsons are still alive? “Not great-great-grandsons, not great-grandsons, but grandsons.” President Tyler was born in 1790. 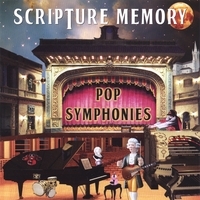 Three years in the making, “Scripture Memory – Pop Symphonies” has been a labor of love for me. It was my desire to make a Scripture Memory record that you would actually enjoy listening to. I decided to do my best to make an excellent record in hopes that you would listen to it multiple times. After repeated listening, the scriptures would be forever lodged in your brain. Strings, horns, pianos, walls of guitars, stacks of vocals. the kitchen sink approach (hey, it’s me), all to coerce you to listen, again and again. Think Beatles with Beach Boy harmonies and Queen/George Harrison guitar solos. Rick is offering the CD at a great introductory price of only $10. You can listen to samples of the CD here and even download one of the full songs for free. How can parents help their kids memorize the Bible? The main thing for young people whether it’s two or twenty-two … is what they see their parents doing and loving to do. In other words, Mom and Dad probably can’t take a fifteen-year-old and out of the blue say, “Now start reading your Bible,” when the fifteen-year-old is not seeing Mom and Dad loving their Bible, reading their Bibles, individually and together. Most nights I spend some time with my three sons reading the Bible and praying together. We have done this ever since they were toddlers, and they are now ages 15, 13 and 10. We usually pick a book of the Bible and read it through a section at a time, and then discuss any questions on it. Right now we are reading through the book of Job. We tried something different this past spring and took a couple months to memorize a chapter of the Bible together instead. We chose James chapter 1. We took it one verse at a time, memorizing the verse and then discussing it together. The next night we would review the verses we had learned and then learn a new verse. If we had been really disciplined at it, I guess we would have finished in 27 days, seeing as there are only 27 verses in James 1. But between nights missed and extra review nights thrown in, it took us a couple months. The important thing is we kept at it, and all three boys eventually were able to recite James chapter 1 from memory. We also talked about the importance of meditating or reflecting on God’s Word throughout the day. This is really the whole reason to memorize Scripture anyways — that we might store it up in our minds and our hearts and allow God to change us by his Word. The method we used for memorizing is called the “stacking” method. This is the method taught by Janet Pope in her excellent book, His Word in My Heart: Memorizing Scripture for a Closer Walk with God. You can read more about the stacking method at Lifehack, or you can read John Place’s story of how he used the stacking method to memorize 7 chapters of his psychology textbook, over 23,000 words, when he was in college. Andrew Davis also gives a good explanation and guide in his article: An Approach to Extended Memorization of Scripture. People are using the stacking method to memorize all sorts of things. What could be more important than memorizing God’s Word and treasuring it in our hearts? Update: Later we went back and re-memorized this chapter using the first-letter method. Actually, the stacking method and first-letter method work really well together. You can learn more about the first letter method in The Bible Memory Version: A Tool for Treasuring God’s Word in Your Heart. Here is a great new resource for families. Seeds Family Worship has produced four new CDs with songs taken directly from Scripture. Each CD contains 12 passages of Scripture focusing on a certain topic, such as Praise, Faith, Purpose or Courage. The music is modern and upbeat, and you can listen to samples before you buy.